Miso Crafty Knits: I wish I was an octopus! I wish I was an octopus! The part of pregnancy that I've been waiting to happen has finally happened - I am full of energy!! I honestly didn't think I would get to this point, since I've spent half of the year overly exhausted, and could barely get the energy and will-power to get myself out of bed (and wondering what in the world was wrong with me for being so lethargic). Who knew building another human being in your belly could be so draining? Well, here I am now, in my third trimester, with waayyy too much energy!! I've been waking up pretty much the same time each morning (at 8:30am! ), and have been going to bed by midnight. Some nights though, I've been staying up until 3am crocheting away (when I'm on a roll, I'm on a roll and better take advantage of it!) but still manage to wake up uber early the next day - and not be tired. Weird, I know. Or maybe it's just summer? The fact that it gets so bright out at 5am and I want to take full advantage of the natural light, since the lighting in my place is practically non-existent. Either way, I don't think this is my "nesting" period, but I'm not complaining!! I honestly believe that since sewing that dress for my friend's wedding, I've been on a major kick. I just don't seem to have enough hands and time to sew and crochet all the things I want to do. I have all these ideas floating around in my head and all I want to do is get started on them all. I've accomplished a few things, and there a few projects sitting on the chair next to the desk almost finished...the rush of getting something done and ticking it off my "summer to do" list is exhilarating! Last weekend I went to the fabric store here and went crazy (seriously, I spent over 2 hours in there! ), then came home and rummaged around my fabric stash, then spent the past few days pre-washing, de-linting, and ironing fabric! Sorry for the lousy photo. There's not much light in the corner where my sewing machine is. 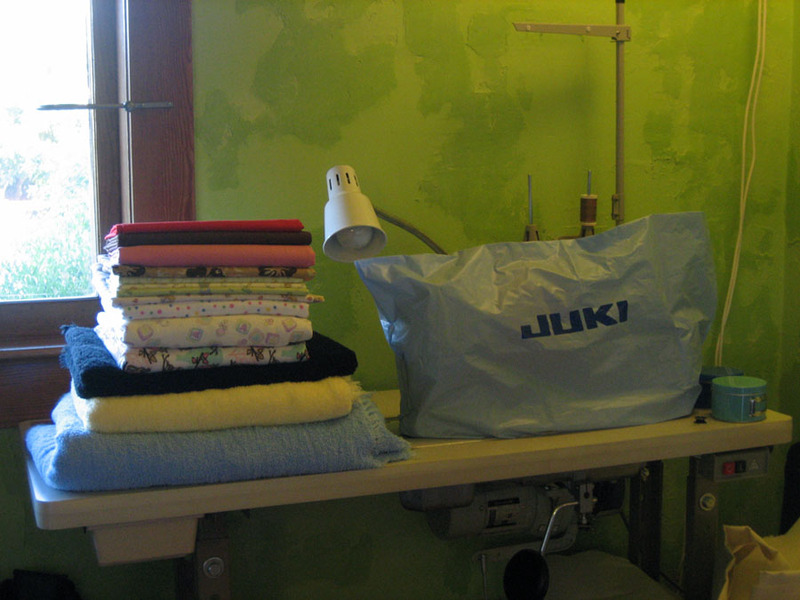 You can't see it, but there are 2 lamps hanging above my beloved Miss Juki, and when I sew I'm pointing all the other lamps in my house at my corner for extra light. The photo came out yellowish green cause that's the color of my walls! The woman who lived in my place previously thought it would be awesome to paint the walls yellow before throwing spackle all over the place, and then painting over it with this neon snot green color. Some days it drives me insane! Brett and I don't really want to re-do it all, me being pregnant and not wanting to inhale the fumes and all, but also cause we know we won't be here long enough to enjoy the fruits of our labour.